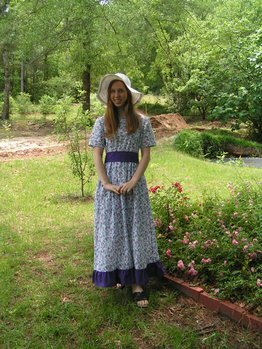 A Graceful Maiden's Memoir: Finished Dress! 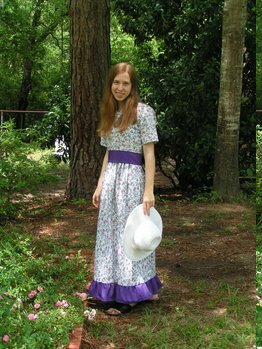 I finished my dress this morning, adding the ruffle and the sash. I got to wear it today to the Montgomery Youth Symphony Concert, and then to our home fellowship. New dresses are so much fun! What a beautiful dress! And hats are so much fun :). Where did you get the pattern? The pattern is an old Simplicity pattern, #9597. We had it in the pattern box! I lengthened it and added the ruffle and sash... It's a nice pattern though, since it doesn't have a zipper, just slips over the head! You did a great job on the dress! The ruffle and sash were a good idea also. Beautiful dress, Anna! It's nice you have the time to sew like that. BEAUTIFUL dress!! I wish I could sew that well! Oh, how funny! I have that pattern too :). I just didn't recognize it with the sash and ruffle :). I love the look of the sash; it is a nice slimming effect. Very pretty! And the hat is cute! The King's Courts is an arts ministry encompassing The King's Praise Ballet, for which I teach 8 classes currently, and The King's Theatre, through which I direct a few productions each year. It is an adventure as I follow God's leading!